The key to dog training is in the WALK. Learn to walk your dog properly and good behavior will trickle down into all areas of your dogs' actions. Ever thought of a career in dog training? 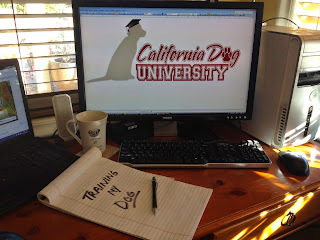 California Dog University has mentored beginning and advanced dog trainers to be the most effective trainers in the industry. Nick Chaisson's instuction in a career course will prepare you for a new business that you will love. Hands on training, ongoing support, and business mentoring will ensure your success in your new career. To fully enjoy life, your work should be enjoyable! We dedicate ourselves to becoming your partner in training your dog. Our advanced education for your family extends two weeks beyond your dogs' graduation. Our support and guidance is available to CDU graduates to ensure you maintain your dog's training. Your success is important to us. We stand proud in our exceptional training of your dog, and stand by you to support and maintain your dog's training. Eliminate Frustration and Chaos....Add in Peace and Balance. As professional people and responsible parents, we know that raising a respectable dog is not an impossible feat....yet, it keeps us up all night, and terrorizes our day as we struggle with nipping, chewing, jumping, biting, and pulling on the leash. There is a solution! California Dog University offers classes in leash walking, potty training, and leadership building that will eliminate biting, jumping, and destruction. With using the proper dog trainer, and the effective dog training methods, you and your dog can be on the path to calm leadership and success. Leaving your dog with a trainer is never an easy decision. You will miss them, but rest assured, they will be having a great time while they learn! They will think they are at summer camp for dogs, no matter what time of year it is. Nick Chaisson and California Dog University's highly trained team make your dog’s comfort and safety their top priority. ﻿Proper training is an essential part of your pet’s health and well-being. A dog trainer teaches more than just sit and stay. Learning to create a calm dog takes a special dog training method based on patience and balance.